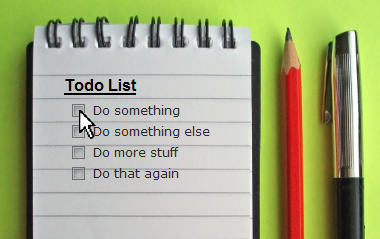 One of the things I do to stay organized is make to-do lists. I make them a lot. I have lists on my phone, sticky notes on my bureaus, marker boards, journals, you name it. Inevitably one of the lists I compile gathers all of the things that I need to get done eventually but aren’t really pressing right now, like close an old account or send that important email I have to write up. I might as well name this list “Stuff I Will Never, Ever, Ever Get To,” because those tasks never, ever, ever get done. I’m tempted to say this is due to my laziness, but I think it’s more accurate to say it’s due to a lack of motivation. Life is busyness, and when you don’t prioritize something, it tumbles farther and farther down the to-do list, until eventually it drops off completely. What’s interesting about this is the tasks that we often allow to go undone are really important things! I’m reminded of Ron Livingston’s famous line from Office Space: “You see Bob, it’s not that I’m lazy. It’s that I just don’t care.” Funny, yes, but totally accurate, is it not? What we do reflects what we value. The same is true of what we leave undone. I say all this because we, the people of Living Faith, have been bombarded of late with what is essentially a to-do list of really important things. Two weeks ago we heard about disciple-making, and this week it was church-planting. Both are huge on the heart of God and are spoken about at length in Scripture. But often, you and I get caught up in the urgent things of life, so much so that the important things are left undone altogether. Things that God highly values get lost on us because we’re consumed with the daily grind, always shuffling from one thing to the next because there’s just so much to do. And everything that doesn’t get done gets put in the “Someday” or “Future” category of our lives, and just like the to-do lists, in time will usually disappear completely. Friends, this should not be. For the people of God, the question must always be “what does God want?” We are His representatives, His servants. He is our King and we orient our lives around what HE says is important. As we seek Him, the Kingdom is revealed before our eyes, as is our role in His Big Plan. We see clearly what it looks like to be part of the Dance of God, with all of us moving in time to the beat of His glory. And those are the moments when we feel truly alive, when everything comes into focus and the “urgent” things of life fade to distant memories in light of the radiant goodness of our God. Here’s the rub, though: you’re probably going to have to start saying “no.” A lot. Are you a follower of Jesus? Then go value what Jesus values. “Does this offend you?” (John 6:61) It should. The Gospel stands directly in contrast to your agenda and my agenda. The Gospel is about God’s agenda. This is when we start to find out how committed we really are to following Jesus. It is easy to put things off for “someday.” But for the people of God, “someday” is today. For Living Faith Alliance Church, there’s something new afoot. I believe the Spirit of God is at work right now in a totally new way. Do you sense it? The time is now to embrace that newness. No more “someday,” no more future. The future is here. Let the future begin. Older PostRight Here. Right Now.